Retro chic, great pictures and incredible sound: how can we resist? Taking in the incredibly svelte and stylish JVC LT-32DX7, you'd be forgiven for thinking that its speakers had been jettisoned in favour of a design masterclass. Examining this 32-inch LCD TV closer reveals the set's speakers are tucked under a ledge created by the angled silver strip. Full marks for design, but the question remains whether this scuppers this set's audio performance. The JVC's connectivity is impressive. Twin HDMIs provide a futureproof touch, and there's also a set of component video jacks, earning the LT-32DX7 its HD-ready wings with ease. 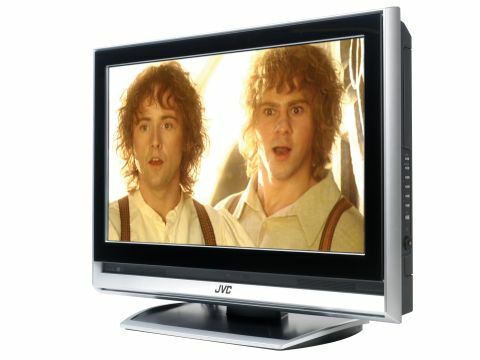 There are also two Scarts (Only one of which is RGB-enabled), and the usual supporting cast of standard-definition connections. Of more interest is the presence of a PC VGA port and a common interface slot for adding subscription services to the Freeview service the digital tuner picks up. The TV supports a seven-day electronic programme guide, which can store up to 10 timer events. Features are promising too. Most impressive is the inclusion of DynaPix HD picture processing, which (amongst other things) reduces noise caused by MPEG video compression, and boosts details using JVC's Digital Image Scaling Technology (DIST). The upshot of this system's presence is a greatly improved picture. The 'HD' suffix is of particular interest as this shows that JVC has tweaked this version of DynaPix so it works with high-definition material, as well as standard-definition fare. Elsewhere, the proprietary Super Digipure feature is included to automatically optimise the picture's contrast. There's also a colour management mode, a Smart Picture option to prevent white parts of the picture dominating, and a picture management option to make bright and dark scenes less extreme. This JVC seems to be packed full of tricks. Enough of the theory and down to business with our test DVD of 2001: A Space Odyssey. Instantly it seems like DynaPix is earning its keep as the colours of the revolving space station's interiors are excellent, with natural tones. Skin tones during darker scenes are also executed effortlessly. Standard-definition pictures are as razor sharp as we've seen on any TV this size. Most impressive. DynaPix HD doesn't pack the punch that we were hoping for with our high-definition feed of Planet Earth. The picture looks a bit soft in comparison with similarly priced rivals out there. Further niggles come in the form of bluish blacks and judder with camera pans. Still, the HD picture is bright, with crisp whites, and is free from noise, provided you have the Super Digipure set to low. Overall, the pictures are great, if not record-breaking. We're saving the best until the last. The stylish, hidden speakers nudge this TV in front of its rivals. There's only one word for their performance: incredible. Somehow these speakers dole out the sort of power and bass performance that leaves contemporaries quaking. Dialogue is delivered effortlessly too. Great stuff. Despite some great pictures, it's the sonic performance that seals the deal for the retro-looking LT-32DX7, and puts this set in pole position as far as we're concerned. No great surprise then that its 26-inch sibling is also a great panel.